Sumit feels that art can be used as the most powerful medium to establish a dialogue or to raise a concern about a cause. Through the recent exhibition titled, ‘Kitaab’ the artist is trying to open a new dialogue with the audience. “Books are records of our civilisation; they are one of the most powerful vehicles in the dissemination and preservation of knowledge. 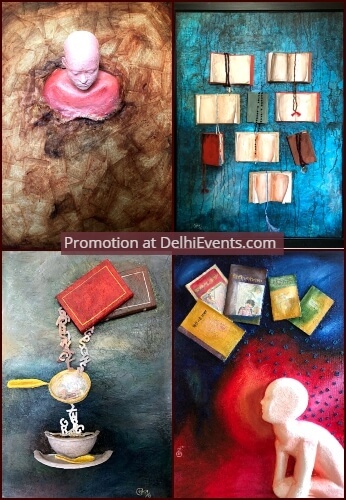 Throughout the centuries, books have also undergone various transitions, which I try to capture through my artworks”, states Sumit. In his works, Sumit diverts from the traditional treatment of flat canvas and rather creates three dimensional relief works that seems to break the boundaries of the canvas frame. The two-dimensional installations, the use of bright and striking colours creates a feel of theatrical winglets.